Do you like your flowers on the bold side? If so, this month’s flower is sure to be a favorite with you. 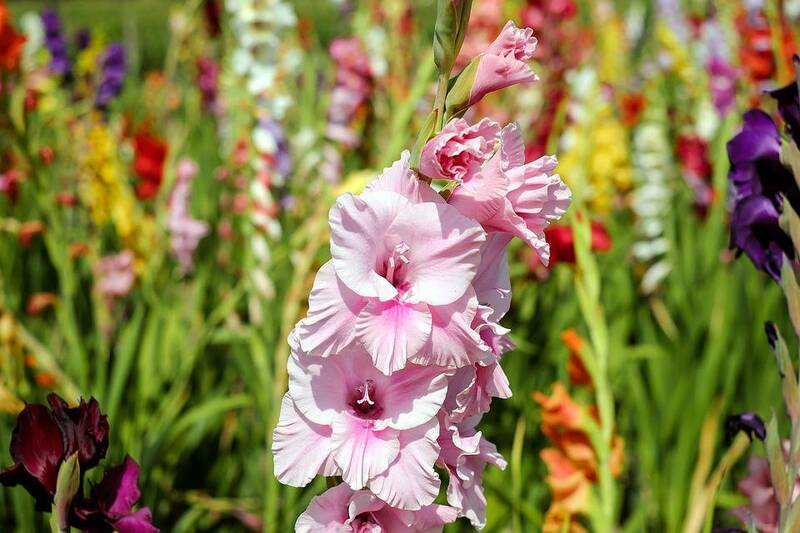 The birth flower for August is none other than the gladiolus. These flowers love being the center of attention. In fact, any experienced gardener will tell you to plant your gladioli with an open area around them so they don’t have to compete with other flowers or weeds for space. August is the perfect time to discover more about this inimitable bloom that savors the spotlight. There are 260 species of gladioli, and 250 of those originated in Africa. The remaining species are scattered around Europe and Asia. These fragrant, spiked blooms are part of the iris family and thrive in warm climates. The gladiolus is a popular favorite in vases, backyard gardens, and prestigious flower shows. This bloom can be red, purple, yellow, pink, orange, green, coral, or white. They are even available in bi-color. Last spring, my friend invited me over to help her plant some gladioli in her garden. We debated about where to put them and finally decided on the back section of her garden. These flowers grow so tall, and she didn’t want them to overshadow any of her other flowers. They serve as a lovely backdrop to all of her other blooms. I paid her a visit yesterday, and I can tell you we chose the perfect spot! If you live in growing zones 7 through 10, then your gladioli will be safe over the cold weather months. However, if you live in another growing zone, dig up your gladioli and store them inside over the winter. You can put them back in your garden in the springtime. If you’re interested in growing gladioli, you should know they are not fond of the cold weather, so they should be planted in the spring after you’re sure that the last frost has passed. Select a place in your garden or yard that receives full sunlight. Place two to four inches of mulch around your flowers to help them retain moisture. In the summertime, water your blooms if it rains less than an inch in one week. Some parts of the gladiolus can cause skin irritation. Consequently, some gardeners wear gloves when caring for these majestic flowers. Along with being a symbol of sincerity, strength of character, and generosity, the gladiolus can symbolize love at first sight. Give a gladiolus to someone and you are piercing their heart with your love! Gladioli can grow to be two to four feet in height. Candyman, Dream’s End, and Prins Claus are three popular varieties of gladioli. If you’re looking for a colorful flower that makes a statement, then the gladiolus is for you. Be sure to take a moment or two to admire these gorgeous August blooms!